Copperloy’s dock boards can be customized to match any specification, solve difficult challenges, or work with preexisting equipment or spaces. With our in-house engineering team, state-of-the-art manufacturing facility, and over 60 years of experience, we’re confident in our ability to get you the dock board you need and made in the USA. They’re high strength, durable and portable, with some of the highest capacities in the industry. We have a variety of options from aluminum and all steel boards. Furthermore, we have the ability to custom manufacture dock boards to just about any specification, size or requirement. Our steel dockboard has welded curbs to handle the toughest of tasks and it’s our most durable option. It features a heavy steel tread plate deck and fully welded steel curbs. The welded board comes in either 15,000-lb. or 20,000-lb. gross capacities. Each is available in 60, 72, or 84-inch widths, with numerous options for length and height differential. Standard features include 10, 14, and 18-inch locking legs, 5.5-inch curbs, fold down lifting loops, and an 11 lip is standard, 14-inch lip available. Special sizes and capacities are available. Contact the factory for availability. Fully welded all steel curbs. 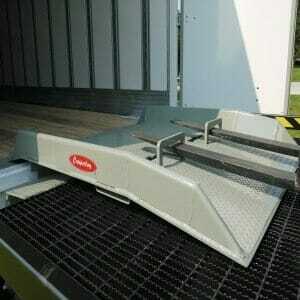 Heavy steel treadplate deck for high durability and extended service life. Most durable for the greatest value. Engineered for the toughest duty cycles. Fold-down lift loops are standard. Lift chains are an option. This version is all aluminum with welded curbs. It comes in a spectrum of models. There are three gross capacities, 10,000, 12,000 and 15,000 lbs with options for 11 or 14-inch lips, 9-inch and 13-inch locking legs, and 4-inch aluminum curbs. Depending on capacity, you’ll find widths from 54 to 72 inches, and lengths of 30 to 84 inches. That means we have just about every option you can think of to fit just about any requirement. 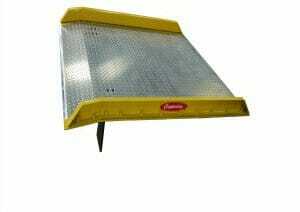 Our aluminum dock boards are tough, inexpensive, and lightweight just like our yard ramps. Fully welded aluminum curbs for the highest strength. Tough aluminum tread-plate for lightweight, corrosion-free surface. Mid to rough duty cycles. Our other aluminum dock board has bolt on steel curbs and comes standard with features such as an 11-inch lip, or optional 14-inch lip, 4-inch curbs, 9 and 13-inch locking legs, and a lift chain option. Our two standard weight capacities are 10,000 and 15,000 lbs. Each capacity is available from a 54-inch width up to 72 inches, and lengths of 36 up to 72 inches. The dock boards combine both lightweight features and durability, while also being a great low cost and affordable dock board option. It fits between an all steel dockboard and the all aluminum dock board. Structural steel curbs bolted on 6″ centers. 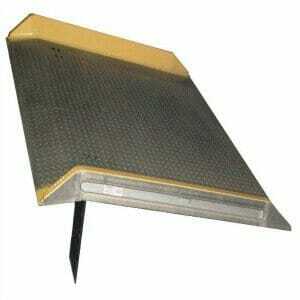 Tough aluminum tread-plate deck for lightweight, high traction, corrosion free surface. Watch the dock equipment video below to learn more about the Copperloy® dock board.